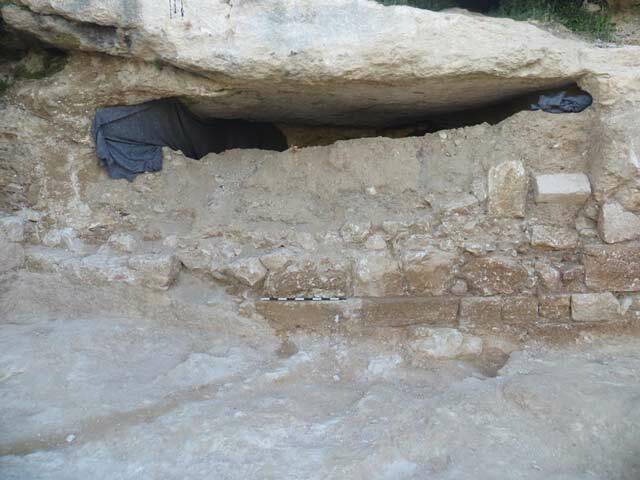 In April 2016, a salvage excavation was conducted in the Wadi el-Joz neighborhood of Jerusalem (Permit No. A-7692; map ref. 222762–855/633179–313), prior to construction. 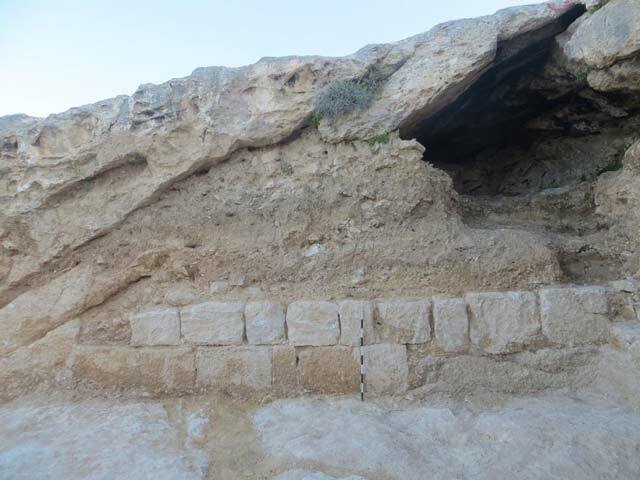 The excavation, undertaken on behalf of the Israel Antiquities Authority and financed by the Jerusalem Municipality, was directed by D. Yeger, with the assistance of N. Nehama (administration), A. Hajian (surveying and drafting), D. Tanami (metal detection), N. Sanduka (area supervision), A. Goel (numismatics), I. Lidsky-Reznikov (pottery drawing), V. Nosikovsky (metallurgical laboratory), Y. Yolowitz (studio photography), B. Touri (East Jerusalem sub-district archeologist), Y. Nagar (physical anthropology), E. Eshel (epigraphy) and A. Re’em (Jerusalem district archaeologist). 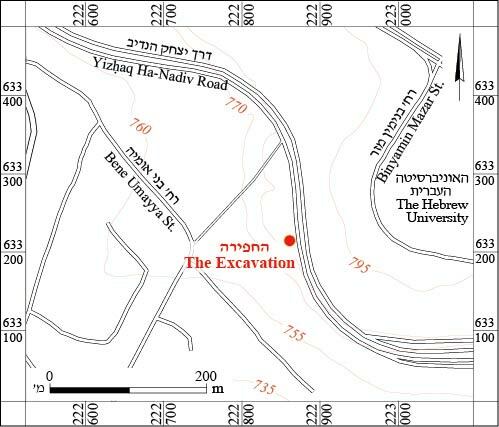 The excavation was carried out in a lot bordered on the east by the Maʽale Adumim–Jerusalem road (Yizhaq Ha-Nadiv Street; Fig. 1), on the western slope of Mount Scopus, which descends gently to the west and south, toward the Upper Kidron Valley. 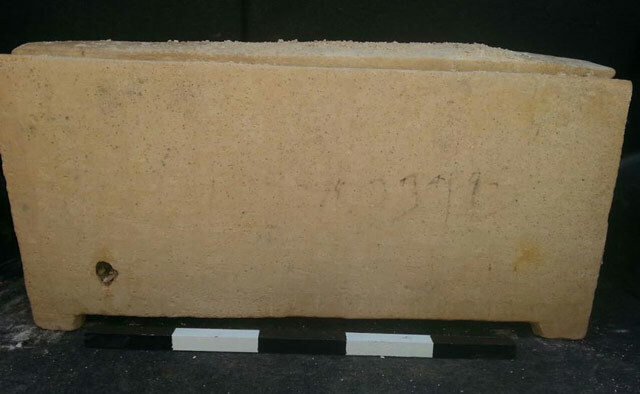 The slope bedrock is soft chalk of the Senonian period, which is white until exposed to sunlight, whereupon it darkens and becomes pale gray (qa‘aquleh). Outcrops of the ancient Bina formation of the Turonian period, which is characterized by hard chalk (meleke), are found at the bottom of the slope. Over the years, light brown rendzina soil has accumulated over the bedrock (thickness 0.2–0.5 m). It provides good drainage and is rich in organic matter and limestone, and is therefore suitable for agricultural crops—especially vineyards and olive trees—as can be seen in the immediate vicinity. Although the bedrock was exposed in most of the lot, no signs of agricultural activity were evident. As chalk is easy to quarry and found in proximity to the city, it served as a readily available raw material for building-stones, ossuaries and stone vessels. Furthermore, chalk is durable and strong, and thus suitable for hewing large burial caves. Indeed, this area is known to have been part of the necropolis—the city of the dead—that surrounded Jerusalem during the Second Temple period, and included several magnificent examples (Kloner and Zissu 2003:2). Several burial caves dating from the Second Temple period were identified near the excavation (Kloner 2002:106, Sites 251–255). 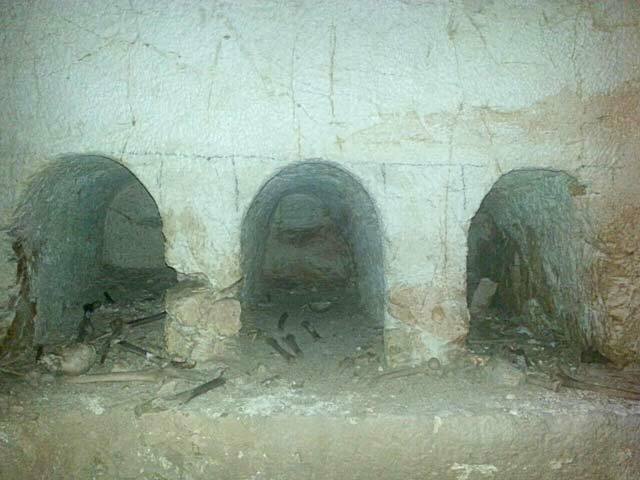 Four burial caves and a water cistern dated to the first century BCE–first century CE were excavated north of Yizhaq Ha-Nadiv Street (Weksler-Bdolah 1995:72). 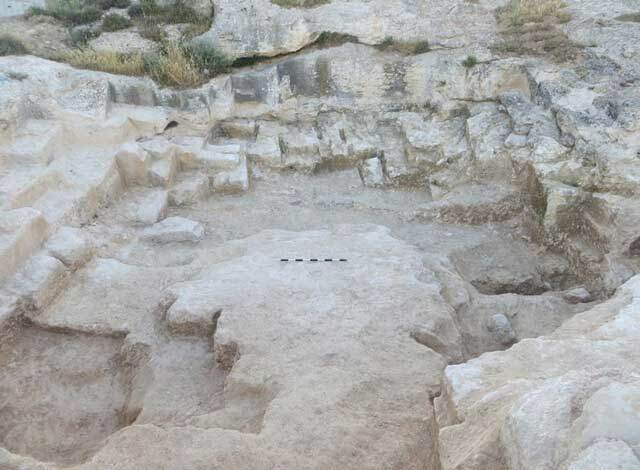 An Iron Age quarry, a ritual bath (miqveh) from the Hasmonean period, burial caves from the end of the Second Temple period and an Ottoman-period guard tower were also excavated nearby (Re’em 2011:66). A trial excavation conducted in 2015 preceded the current field work. Two stone quarries (L8, L10; Figs. 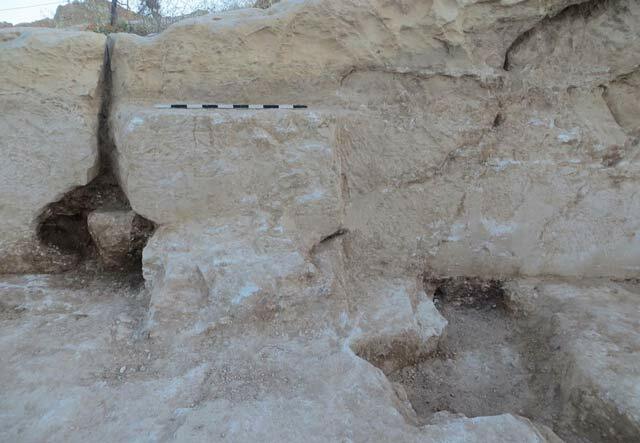 2, 3) were excavated, and four burial caves (A–D), dating from the Early Roman period, were documented (Yeger 2016). 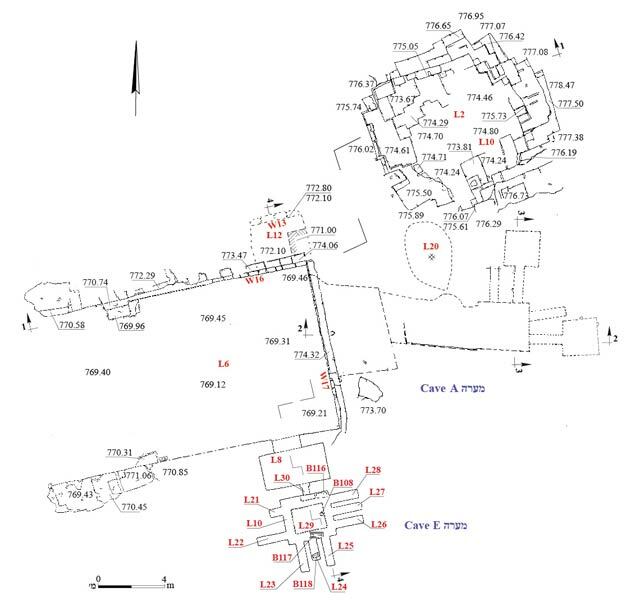 In the current project, the excavation of Quarry 10 was completed, a courtyard leading to Burial Caves A and E was excavated, a tentative plan of Cave A was drawn and Cave E was documented. The quarry comprised a small, central courtyard (L2; 10 × 10 m, max. height 2.2 m; Fig. 4) surrounded by terraced walls. Within the quarry was filled with light-colored rendzina consisting of several fragments of stone ossuaries (Fig. 5), pottery sherds, a large amount of quarrying debris and a concentration of building stones. It seems that the building stones were damaged during their extraction or secondary dressing, and were discarded back into the quarry with the quarrying debris after it was no longer in use. The pottery sherds found in the fill were dated to the Iron Age IIB, and the Roman and Byzantine periods. Judging by stones whose quarrying was not completed and the imprints on the quarry’s floor, it is possible to estimate the dimensions of the stones produced there (average size 0.3 × 0.4 × 0.7 m). The dimensions of these stones, which largely fit the average size of ossuaries—the length dictated by the size of an adult’s long bones, and the width and height dictated by the size of the skull and pelvis (Rahmani 1994:6)—as well as the proximity of the quarry to Jerusalem’s necropolis hint to the use of the stones produced at the quarry. Southwest of the quarry was an irregular-shaped plastered installation (L20; 2.0 × 4.5 m). White plaster was applied to gravel and small fieldstones laid on the bedrock. No datable material was found when the installation was dismantled. A biconical leaden pellet (Fig. 6), which is a type of sling stone that was common in the Hellenistic period and continued to be in use during the Roman period, until the second century CE, was discovered near the installation. 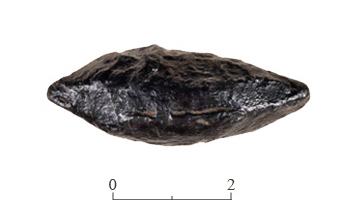 The latest evidence of the use of a biconical leaden pellet in Israel dates from the end of the first century CE and was found in Gamla (Stiebel 2013:297). The Courtyard. A large courtyard (L6; 10 × 13 m, max. height 5 m; Fig. 7) was hewn in front of Cave A. Its walls were coated with light brown plaster. The quarrying of the courtyard exposed a natural cavity (L11; Fig. 3: Sections 1–1, 4–4) to the north of the courtyard, which necessitated completing the courtyard’s northern wall with dressed-stone construction (W16; Fig. 8). A wall (W13) built of fieldstones and dressed stones in secondary use bonded with gray mortar was built inside Cavity 11. The floor of the cavity was paved with concrete (L12), evidence of its later use. The bedrock on both sides of the entrance to the courtyard rises slightly and protrudes into the courtyard in L-shaped rock-cuttings (Fig. 10); these may have marked the entrance to the courtyard, considered an impure area. Quarrying marks on both sides of the courtyard attest to the production of building stones, which probably took place when the courtyard and Cave A were hewn. The courtyard floor was leveled with small fieldstones and tamped earth, remains of which were preserved near the walls (Fig. 9). A coin of Alexander Jannaeus (104–80/79 BCE, Jerusalem mint; IAA 158636) was discovered on the courtyard’s floor. While Burial Cave A was still in use, a second burial cave (E, below) was hewn into the southern wall of the courtyard. Cave A. A threshold built of dressed stones (W17; Fig. 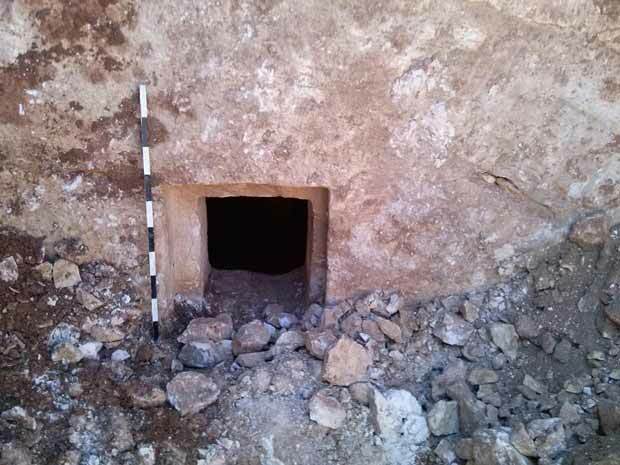 11) was set at the entrance to Cave A. A brief examination of the cave indicted that it had several loculi. Following the first use of the cave, the entrance was sealed with medium-sized fieldstones, without mortar. Approximately a meter of alluvium, containing pottery sherds from the Iron IIB, Roman, Byzantine and Mamluk periods accumulated in the courtyard, in front of the entrance to the cave. At some point, the sealed entrance was breached, and the opening to the cave was narrowed with small fieldstones and dressed stones in secondary use. It seems that during this phase, the cave served as a temporary dwelling or was used for agricultural activity. Cave E. The cave consisted of an anteroom (L8; 2.2 × 4.0 m, max. height 2.3 m) treated with light brown plaster, similar to the plaster applied to the walls of Cave A. An alluvial accumulation in the courtyard near the cave yielded a concentration of large fieldstones and quarrying debris. This debris originated from the ceiling of the cave’s anteroom when it was damaged, probably due to later quarrying or when an access road to a nearby residential building was paved. An opening (L30; 0.4 × 0.5 m, height 0.55 m; Fig. 12) enclosed with a frame (width 0.1 m, thickness 0.2 m), against which the roll-stone rested, was set in the southern wall of the anteroom. The opening led, down a step, into the burial chamber (L10; 2.4 × 3.0 m, max. height 2.4 m), which has a central standing pit (L29; 1.5 × 2.0 m, depth 0.4 m). Two loculi (L21, L22) were installed in the western wall of the chamber; L21 was incomplete. Three loculi (L23–L28; average dimensions: 0.5 × 0.7 × 1.9 m) were installed in each of the eastern and southern walls. On the walls of the room were charcoal sketches denoting the location of the loculi (Fig. 13), indicating that an additional loculus was meant to be hewn in the center of the western wall. Human bones were scattered in the standing pit, and found in articulation inside the loculi. The bones belonged to several individuals representing a range of ages, indicating that this was a family burial cave. The cave yielded an intact cooking pot (B108; Fig. 17:3) and three ossuaries (B116–B118; Figs. 14, 15). Ossuary 116 is roughly carved and is unadorned; it has a flat lid, which was found broken. Ossuary 117 (0.3 × 0.4 × 0.7; Fig. 14) is similarly roughly carved and unadorned; it has four low legs and a flat lid. One side of the ossuary bore a shallow engraving and writing in charcoal of the name Shifra or Shofra, as well as a perforation (diam. 1 cm) its lower corner. The front of Ossuary 118 (0.20 × 0.30 × 0.35 m; Fig. 15) is colored with a pale red pigment and decorated with a shallow engraving of two metopes set within a zigzag frame. The metopes are separated by a palm tree, whose branches are drawn as zigzag lines shaped as an upward-open semi-circle. In the center of each metope is a six-petaled rosette; each petal is adorned with a zigzag pattern. Both rosettes are surrounded by two concentric circles separated by a zigzag pattern. The lid has a gabled cross-section. Once the cave was no longer in use, the burial chamber was blocked, the anteroom was filled with quarrying chips almost to its ceiling and the opening was sealed with fieldstones (Fig. 16), as like the opening to Cave A.
Pottery sherds from several periods were discovered in the fills within the quarry and the courtyard leading to the burial caves: a bowl (Fig. 17:1) and a pinched lamp (Fig. 17:2) from the Iron Age IIB; a cooking pot (Fig. 17:3), jars (Fig. 17:4–6) and an amphora (Fig. 17:7) from the Early Roman period; bowls (Fig. 17:8, 9) and a krater (Fig. 17:10) from the Late Roman–Byzantine period; and a bowl decorated with a sgraffito design from the fourteenth–fifteenth centuries CE (Fig. 17:11). Even though the caves were not excavated and were only partially documented, several conclusions can be drawn. The practice of interring the dead in loculi first appears in Jerusalem during the Hellenistic period (second century BCE). However, the use of both loculi and ossuaries within the same burial cavebegan later, and is dated to the first century BCE and first century CE (Kloner and Zissu 2003:32). The loculi in Cave A suggest that its initial use was in the second century BCE, and that it continued to be in use until the first century CE. 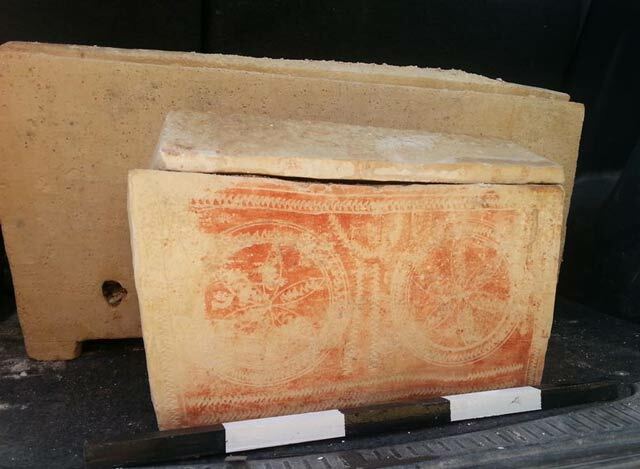 Perforations such as the one at the bottom of Ossuary 117 are found in ossuaries dating from the end of the Second Temple period, and attest to the strict observance of the rules regarding the impurity of the dead (Omer and Zissu 2008:162–163). The charcoal markings showing the location of the loculi on the walls of this cave indicate planning. The preservation of these markings, along with the unfinished plan of the cave, may reflect the short period of time during which it was in use. 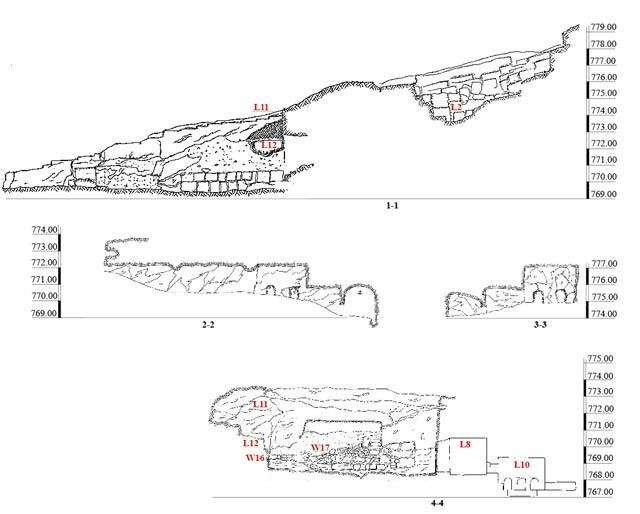 Thus, along with the co-use of loculi and ossuaries in the same cave, suggest that Cave E should be dated to the second half of the first century CE. The openings of the caves were deliberately sealed, and much effort was invested to make it difficult to breach them. The act of sealing them may have been done because of an event that forced the owners of the cave to stop using it for a long time, such as the Great Revolt. Without an excavation, it is impossible to determine if Quarry 10 preceded the Cave A or vice versa. However, it is apparent that neither one harmed the other, evidence that both were visible. Among the ceramic finds were later vessels, which may have originated from the eroding slope. 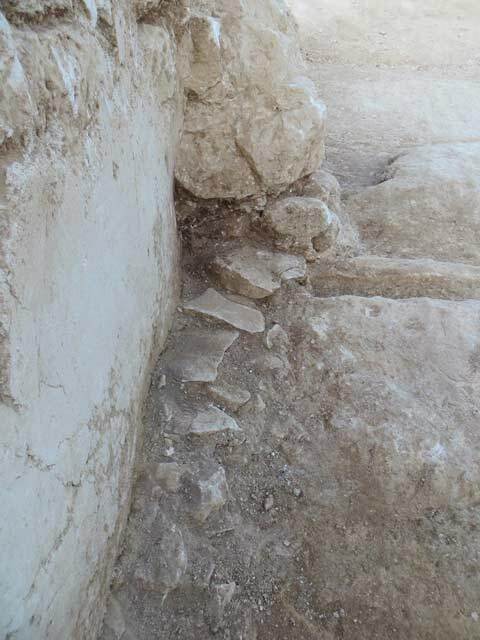 The similar size of the quarried stones to those found in a nearby quarry, which was dated to the first century CE (Yeger 2016), along with the ossuary fragments, corroborate the dating of the quarry to the first century CE. Amar Z. and Zissu B. 2007. The Meaning and Function of the Perforated Sarcophagi and Ossuaries Found in Jerusalem and its Surroundings. Eretz Israel 28. Pp. 159–164 (Hebrew). Kloner A. 2001. Survey of Jerusalem: The Northeastern Sector (102) (Archaeological Survey of Israel). Jerusalem. Rahmani L.Y. 1994. A Catalogue of Jewish Ossuaries in the Collections of the State of Israel. Jerusalem. Re’em A. 2011. Iron-Age Quarries, Second Temple Period Installations and an Ottoman Watchtower on the Southern Slope of Mount Scopus, Jerusalem. ‘Atiqot 63:27–43. Stiebel G.D. 2013. The Military Equipment. In D. Ben-Ami. 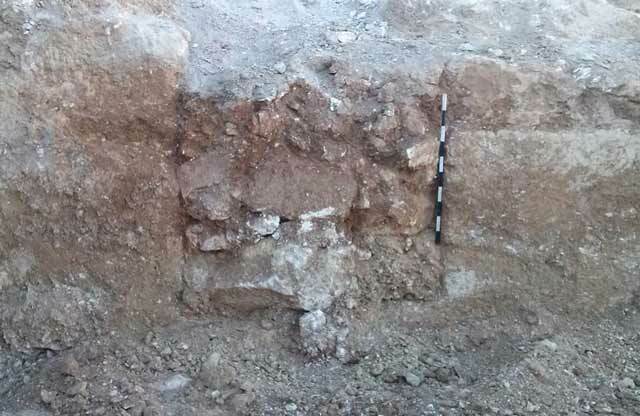 Jerusalem Excavation in the Tyropoeon Valley (Giv‘ati Parking Lot) 1 (IAA Reports 52). Jerusalem. Pp. 297–304. Weksler-Bdolah S. 1995. Jerusalem, Mt. Scopus. ESI 100:72–74. Yeger D. 2016. Jerusalem, Wadi el-Joz. HA-ESI 128. 4. The quarry, looking east. 7. The burial caves’ courtyard, looking east. 8. Wall 16, looking north. 9. Remains of a floor next to the courtyard’s southern wall, looking west. 10. A protrusion in the bedrock in the courtyard’s northern wall, looking north. 11. Wall 17, looking east. 12. Opening of the burial chamber in Cave E, looking south. 13. Charcoal drawing of the plan locating the loculi, looking east. 16. The blockage of Cave E, looking south.